A Fine English 1930’s Art Deco Silver Plated Beef/Turkey/Lamb Carving Trolley by Drakes Silversmiths of Brewer Street, London W1. 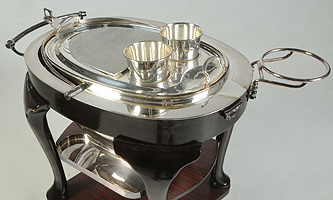 The elegant silver-plated domed-top cart, surmounted atop a mahogany frame, with a hot-water reservoir and twin-alcohol burners below a cutting tray with a pair of sauce/gravy bowls. 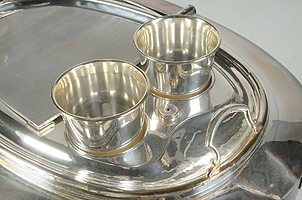 The mahogany apron surmounted with a push/pull handle and a plate-holder, two bottom shelves, one with a condiment tray, raised on four cabriolet legs on rolling coasters. 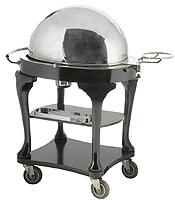 The manufacturer’s metal plaque reads "Drakes, Brewer St. London, W1 - Model D6 - No. 148" Circa: London, 1900.